Meet the Vegan Accessories Brand Committed to Cruelty-Free Fashion and Giving Back to Animals in Need. 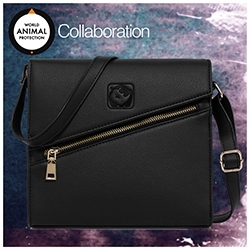 Austin, TX, April 02, 2019 --(PR.com)-- White Rhino Bags, an online bags & accessories brand that exclusively stocks cruelty-free, vegan designer goods has partnered with World Animal Protection US on a collaboration to help raise funds and awareness for their efforts in working towards a world free from needless animal suffering. White Rhino Bags will be donating 15% of all online sales from their three most popular Signature Collection items to help the international animal welfare nonprofit who have been operating for more than 50 years in over 50 countries. With 14 offices around the globe, World Animal Protection works to help animals in communities, in farming, in the wild and in disasters. They influence national governments and high-profile organizations to put animals on the global agenda, encourage businesses to change animals’ lives for the better and educate the general public to help end animal suffering and exploitation.